Security for a wireless Internet connection should be a priority for all Wi-Fi users. Using a strong password is only the half battle won. In order to keep your network fully secured, you need to follow some Wi-Fi security basics. Let us have a quick view of the WLAN security standards and learn more about the security levels of each. It is important to choose the correct level of encryption for your network. A wrong choice can lead to the fall of your private security like a pack of cards. When the Wi-Fi network is left unsecured, it allows many unwanted trespassers to login to your network. Hackers may steal your private information and some may use up your precious bandwidth. Let us see which of the above basic wireless encryption standard will provide maximum protection to your network. The WEP was developed in the 1990s and was the first algorithm for the 802.11 standard. It was developed to keep away hackers and data thieves. However, it had many flaws that lead to its downfall. It was ratified in the year 1999, and said to offer stronger 64-bit and 128-bit encryption keys. However, there was a weakness in the 24-bit initialization vector. This reduced its strength to 40-bit and 104-bit. Thus, allowing hacker to intercept data packets and crack the encryption. This made a Wi-Fi network easy to hack. So, this grand daddy of all is not the choice of security in today’s world. The WPA was created as an alternative to WEP. It was a more advanced, long-term replacement for the WEP. The WPA offered different modes for enterprise users as well as personal users. Those using the WPA-EAP had more stringent 802.1x authentication process using the Extensible Authentication Protocol, that is, the EAP. In case of the personal mode, the WPA-PSK used preshared keys that were easy to manage among home users as well as small offices. The enterprise mode needed the authentication from a server. As it uses a passphrase or password, a hacker needs to guess this secret code to gain access to the network. Thus, any passphrase under 20 characters is easy to break. When using the WPA encryption, make sure you use a combination of characters that includes alphabets, numbers and even special characters. This was a solution offered in 2004 to overcome encryption problems in WEP as well as WPA. The WPA2 uses two encryption algorithms, that is, AES and TKIP. The TKIP is basically the WPA encryption. For better security, it is better to choose AES as and when applicable. 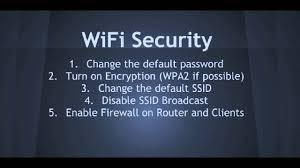 These are some of the Wi-Fi security basics that one should understand and choose wisely. One wrong click and your network could be at the mercy of unethical hackers.